Dear students, IBPS Clerk Prelims Examination is to be conducted in the month of December this year. 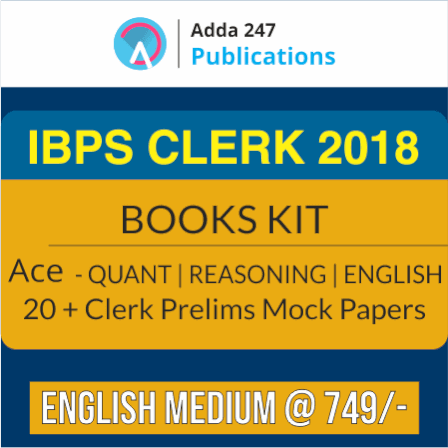 To cater to the needs of banking aspirants, Adda247 now comes up with IBPS Clerk Books Kit incorporating printed edition books that they will require to prepare for this examination. The books incorporated into the package are: 4 Printed Edition books: ACE Reasoning for IBPS Exam Preparation, ACE Quant for IBPS Exam Preparation, ACE English for IBPS Exam Preparation and 20+ IBPS CLERK Prelims 2018: Mock Papers Book. When one is preparing for such a cutthroat competition, she needs to rely on the study material that is based on the latest pattern of these examinations and consolidates everything that could be asked in the exams. Adda247 Publications provides its students with the new pattern study material with the latest theories and questions on hard copy that is real hard to find anywhere else. Also, an exclusive feature of Adda247 Publications lets you access an e-version of every hard copy book which will be updated as per the new changes introduced in the future in the pattern of the concerned competitive examination.